The CW has released a new clip from tonight's episode of DC's Legends Of Tomorrow. Entitled Necromancing The Stone, the episode sees Mallus gaining control over Sara yet again. 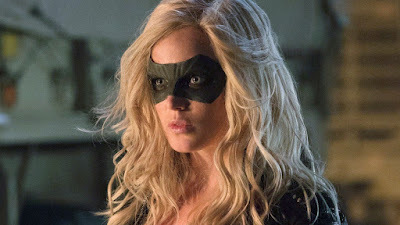 In the clip, Sara finds herself drawn to the Death Totem, which results in her coming face to face with an old friend from her pre-time traveler days - the Black Canary. And be sure to check out promotional images from the episode right here. When Mallus’ power over Sara (Caity Lotz) resurfaces, she unwittingly becomes the bearer of one of the Totems. Rory (Dominic Purcell) must conquer his dark side in order to wield his own Totem power to help save the crew. Meanwhile, Agent Sharpe (guest star Jes Macallan) notices that something is wrong and recruits someone unorthodox to help. Starring Caity Lotz, Brandon Routh, Arthur Darvill, Keiynan Lonsdale, Nick Zano, Maisie Richardson-Sellers, Dominic Purcell, Tala Ashe, Jes Macallan, and Matt Ryan, DC's Legends Of Tomorrow returns with a brand new episode tonight at 8pm.